Artist Michael Dudash shines light on angels among us in this contemporary interpretation of angelic earthly presence. Let this piece comfort you with the knowledge that God sends his angels to shelter your heart in Him! "For He orders His angels to protect you wherever you go. They will hold you with their hands to keep you. Those who live in the shelter of the most high will find rest in the shadow of the almighty. The Lord will protect those who trust him." 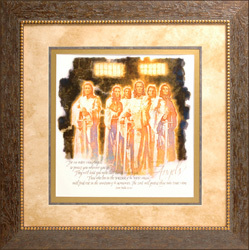 Comes in a rustic gold frame with gold trim and with sandy mat. For He Orders His Angels copyright© 2005 by C. Michael Dudash is prohibited from being copied. 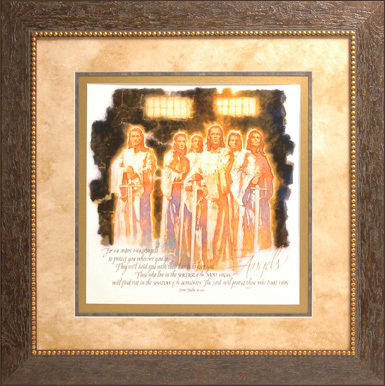 For He Orders His Angels painting by artist C. Michael Dudash can be purchased in art print or canvas form at special sale prices at Christ-Centered Art.